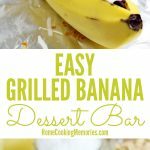 This Easy Grilled Banana Dessert Bar Idea is sure to be a hit with family and friends at your next summer BBQ! Learn how to make grilled bananas, plus get plenty of topping ideas. Grilling is a major part of our summer. We do grill year-round, but the summer is when we kick it up a notch. Dessert isn’t always part of our grilling (much to the disappoint of my kids), but on holidays, like 4th of July and other random times, it’s fun to make a dessert that can be made on the grill. 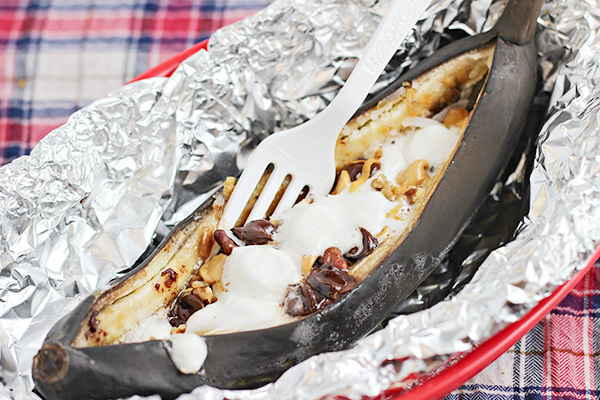 While s’mores are a favorite dessert to have when we are grilling, this year we finally got around to trying stuffed grilled bananas after hearing about them from friends. They are really easy to make and inexpensive too. Plus, including a lot of topping choices, like we do, is easy because you don’t need much for each banana. Each kids makes their own, which is always a hit in our house. No two bananas are topped the same! To make grilled bananas, you will want one banana per person. Hold the banana so it curves upward and cut a slit from the stem to the opposite end through the top of the peel and through the banana, but making sure you don’t cut through the peel on the other site. 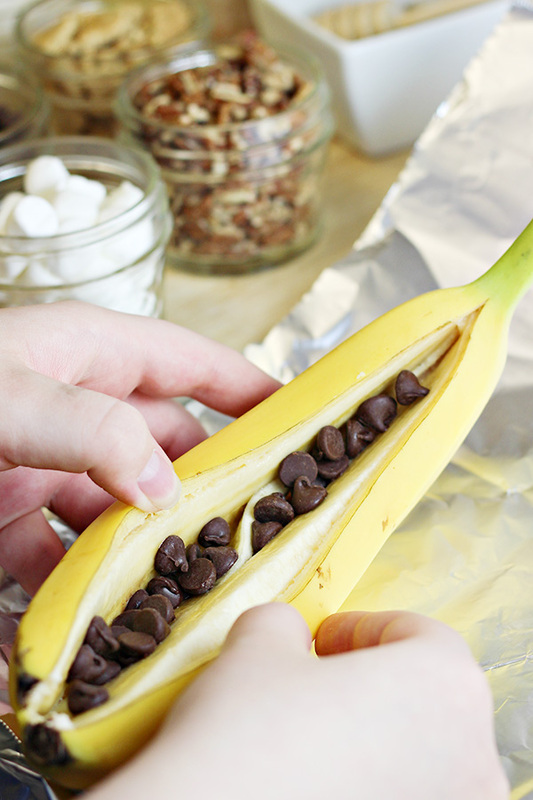 Open up the banana a bit and start stuffing it with your desired toppings. 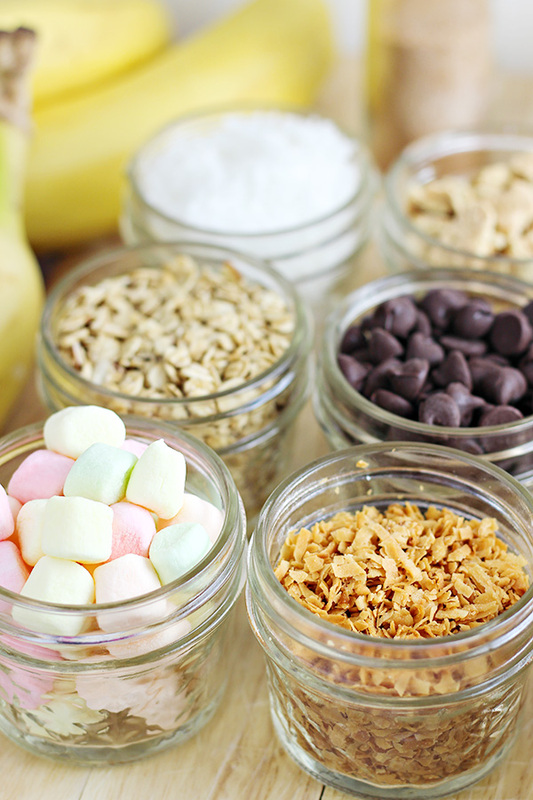 I like to set up a a variety of toppings — things like granola, coconut, marshmallows, chocolate chips, chopped pecans, peanut butter chips, and graham cracker pieces. I placed most of my toppings in small 4 oz canning jars. I even include some honey and cinnamon sugar too, which are delicious additions. After you have filled your banana, it’s wrapped up in foil and placed on the grill. After grilling, the skin will get a bit dark (depends on how long you keep it on the grill), but the inside with be full of warm, gooey, and delicious! Hold a banana with the curve upwards. With a knife, carefully cut a slit in one side peel, from the stem to the opposite end, similar to how you cut up a baked potato. Take care to make sure you don’t cut through to the other side of the peel. With fingers, gently open up the banana a bit. Add toppings as desired inside of the banana. Wrap banana up in foil (either heavy duty foil or a double layer of thinner foil). Place on grill for about 8-10 minutes, or until toppings are melted as desired and banana has softened. Remove from grill, open up foil and serve. My fellow #SundaySupper food blogging friends are also sharing amazing recipes for summer BBQ’s. Check them out! I love this dessert idea! Thanks so much for sharing with us at Full Plate Thursday, we sure enjoyed your post! Oh my – this Looks incredibly delicious! Thanks for sharing at the What’s for Dinner Link party! Looks beautiful and sounds decadent. what a great dessert idea! I find funny that people get so excited about banana boats. It is a very common German BBQ treat in summer. Actually, we like to put slices of chocolate in the middle or Nutella, keep it simple. So yummy! Banana and chocolate to the rescue! This is the perfect summer dessert! You could use so many different toppings. 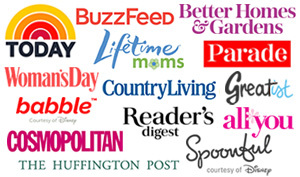 Congrats on being featured in the This Is How We Roll link party at Organized 31! I’m pinning this post now. 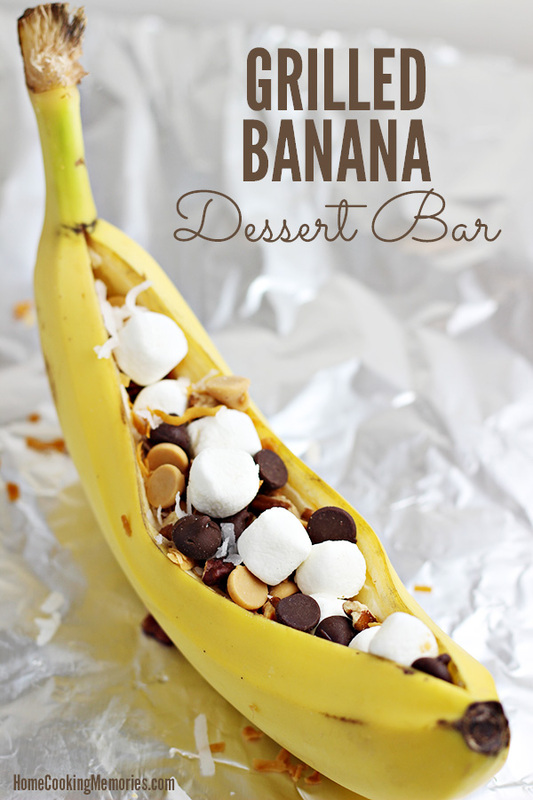 I love banana boats and a banana boat bar is a great idea!! Thanks for sharing with us on Throwback Thursday! I have never tried grilled bananas but these look fantastic! Thanks for sharing with Small Victories Sunday Linkup last week. Pinning to our linkup board and hope you joined us again this week. 100% pinned, this looks mouthwatering amazing!!!! This is a great recipe! I would love for you to share this at my party Making Memories Mondays going on now! Hope to see you there! These would be great for camping!!! Oh! Those look delicious, I’m going to have these at our Father’s Day BBQ this weekend! SERIOUS yum factor going on here…I am dangerously close to jumping in my car to go pick up the ingredients right now!! Hurray for awesome posts on Snickerdoodle Sunday- thank you for swinging by this weekend! Im confused..I PINNED this recipe to Pinterest, yet it was deleted because of copyright infringement, yet you have a PIN IT button right underneath it…. Anyway it looks totally delish and I will be trying the recipe! I got the notice too — and I’m just as confused. I’ve filed a notice with Pinterest about it so hopefully the situation will be resolved soon. You definitely didn’t do anything wrong…it even sent the same thing to me and it’s MY image of something I made and photographed. And thank you for your sweet comment! This is a very cool recipe. I’m not a fan of banana’s but I love this post! Thanks Yosef! I have friends who can’t stand the texture and taste of bananas so I know this definitely would NOT be for them. But if you have anyone who does, this is a fun one. I love these! 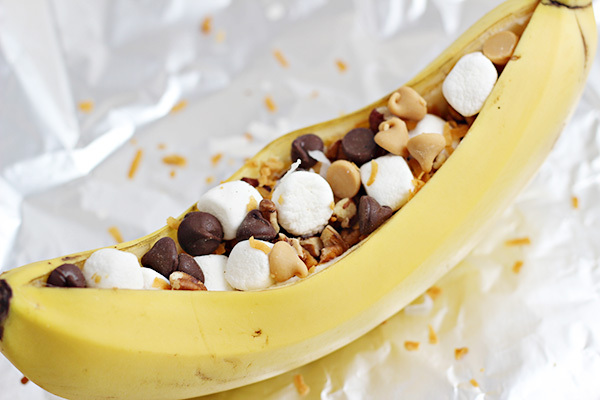 We always called them “banana boats” back in the days of Girl Scout camp – we’d throw them in the bonfire to cook. Such gooey delicious treats! This brings back so many memories of childhood with our banana boats. Reminds me I need to do this with my boys. This is definitely one of my all time favorite summer desserts. We always do this for camping too! Such a fun and easy treat. 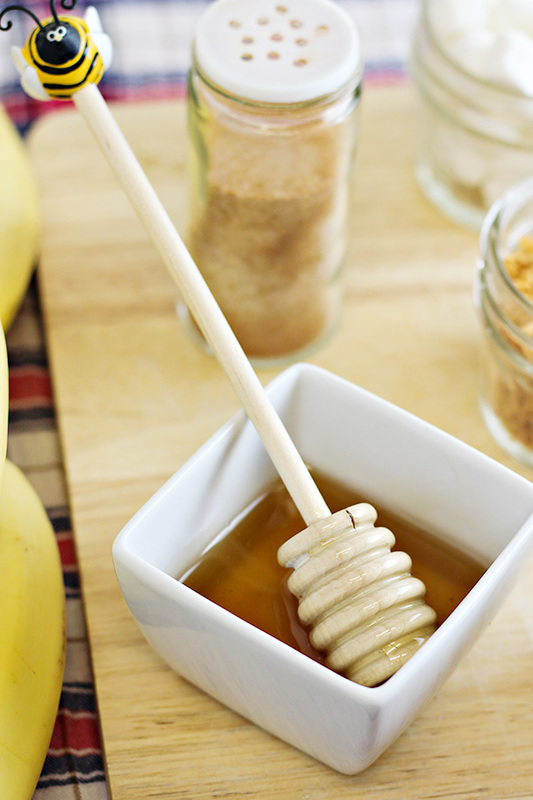 I never thought to add honey or granola though…I will definitely be trying that next time! This is such a cute idea! I pinned it to my “Get Together and Chow” board. 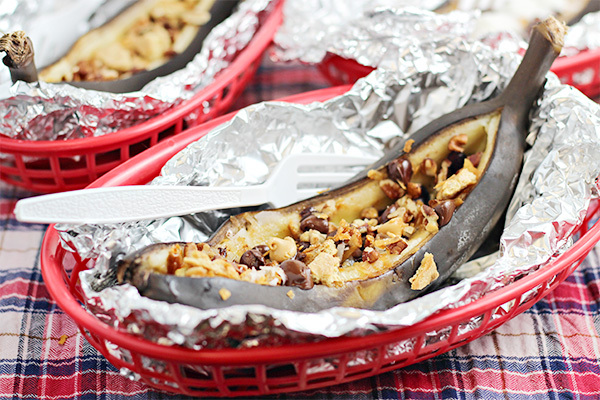 I never thought of letting my kids make their own grilled bananas – but they will LOVE it! This is so cute! What a neat idea, and the dessert bar is a great idea as well! Woah. Why have I never done this before? I’m headed to the store for bananas right now. We make these when we go camping. Love all the new ideas I have for them because of your post. So cool! We used to make these in girl scouts! Memories! I remember these from my girl scout days! Now why haven’t we tried these at home? Yummy party idea, too. This is such a cute idea! 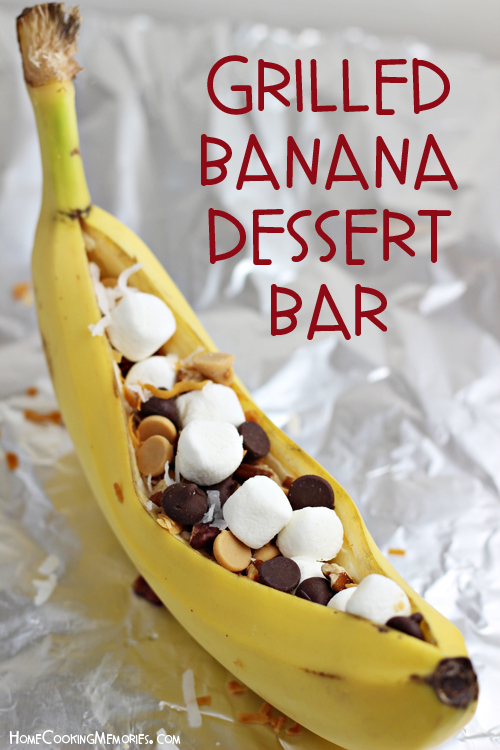 It is so quick and mess free and everyone can customize their own banana! Love it! My mouth is watering looking at those pictures. Great recipe!! Okay now, this dessert is just too much fun!!! Love it, love it, love it! I love grilled bananas! They are so different, yet so incredible! 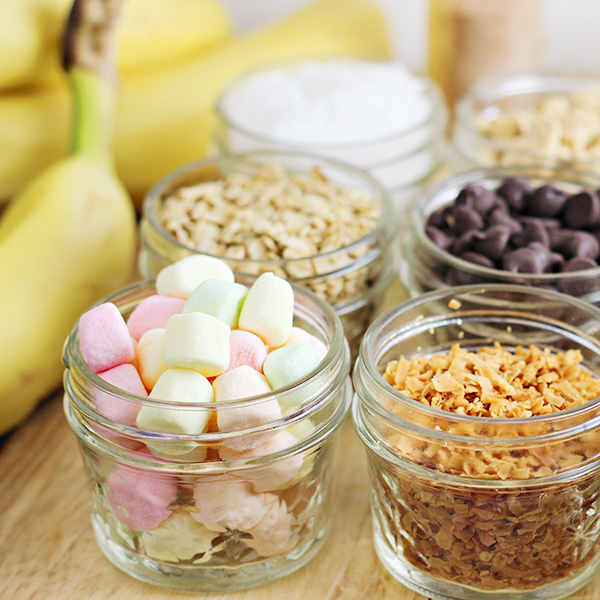 Love your recipe and the idea of making a dessert bar!